I visited one of our long-time customers to observe how they use BumbleBee at their child care center and get feedback on potential improvements. I observed that the director nimbly jumped around BumbleBee by almost exclusively using the “Global Family Search” in the menu bar (shortcut key “/” or backslash). Her hands rarely left the keyboard to use the mouse. It was effortless. It was then that I realized how integral the family data search is for our users. We’ve made many improvements over the years, but this past weekend we deployed our biggest enhancement since we launched the family data search. We now have given the ability to search on email addresses as well while at the same time doubling the average speed of search. This little bit of magic took a lot of work behind the scenes but the result is a vastly improved user experience. On a related note, we made the family index page (hit enter in the global search area). We also improved its performance and reformatted it to have only the information you need. Please let us know if you have any thoughts or feedback on the enhancements. Are you surprised? Another week, another round of high profile password hacks followed by new articles saying this is a “wake up call” This one was on the satirical news site “The Onion” so we hope that there was little harm done by the attack. You might be amused by this, but I think there is a lesson for child care managers in the mistakes of these companies. “After all”, one could think, “we are a child care center not a national organization.” But I think child care organizations, not matter how small, need to use good practices when securing sensitive information systems. Especially when they contain precious vital information. Also, we have been blogging a series about moving your Childcare Management Software applications to the cloud, and putting personal information for you preschool needs to be accompanied by good security practices. Easy to remember and hard to guess – You guessed it: “itsasecret” no “123456” or “elephant“, are easy to guess. Actually, research shows that common combinations like busybeesknees are very difficult to guess but easy to remember. DRY (Don’t repeat yourself) Passwords – Use a different password on each site instead of the same one over and over again. To remSee password keepers below. Use a different Password for each Site – Ever wonder why you get an email from everyone in a Facebook friends address book? This is often because the hackers attack a weaker site and then try that password on other more secure sites with the same public email address. And it’s no surprise it works. If you have a lot of passwords to remember, see the next tip. Undeniably, childcare management and administrators wear a lot of hats and that includes computer software security. Use a password keeper – My favorites are LastPass and KeePass for Windows. You can even have them create passwords for you and then copy paste them into the windows. A side benefit: if you cannot remember your Facebook password this will slow you down as well as hackers. Use 2-factor authentication – Say what? This is becoming more common so you might see more websites enable it. Twitter and Google now use it. It basically requires a person to have two pieces of “identifcation” to reset a password. Like your mobile phone and your password. That makes it hard to replicate “you”. 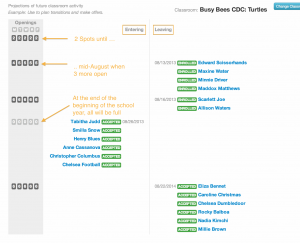 At BumbleBee, we are constantly trying to save Childcare Administrators time. I saw this Ted video about the “10 top time-saving tech tips” and, while it’s not specific, it is fun and very share-worthy early childhood educators. Take a look and let me know if you think David Pogue missed any. What are you favorite shortcuts? Enter them in the comments or email me. Sending birthday emails is not only a good way to recognize developmental milestones but also checkin on administrative issues. 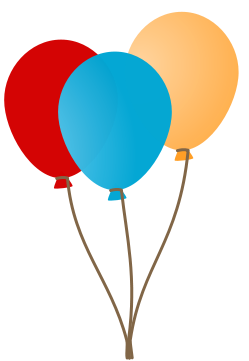 Today’s is the 20th anniversary/birthday of the World Wide Web. It was this day in 1993 that Tim Berners-Lee released his code, for free to the world. In honor of the day, CERN, the international physics research facility where Bernes-Lee worked, re-released the first webpage (related news story). In honor of this birthday, we would like to make a formal announcement about automatic birthday emails in BumbleBee to simplify child care management. It’s a new optional feature of BumbleBee that allows you to automatically send a birthday greeting to the parents of your current families and prospective families. This is a good way to touch base with families and was an oft requested feature when we first released BumbleBee. There are a number of good ways you can use this for helping managmenet at your child care center: (1) wish the family well on the development milestone, (2) request updates to immunization forms for the child, (3) provide tips for each age, (4) see if they still interested in being on the waiting list. Customizable and format-able email message. Send to people on waiting list, enrolled or even just interested. Messages are sent in advance of the birthday with respect to time zones. Checks for twins and potential duplicate addresses. Please contact us if you would like to learn more about our email for child care management software or other features. 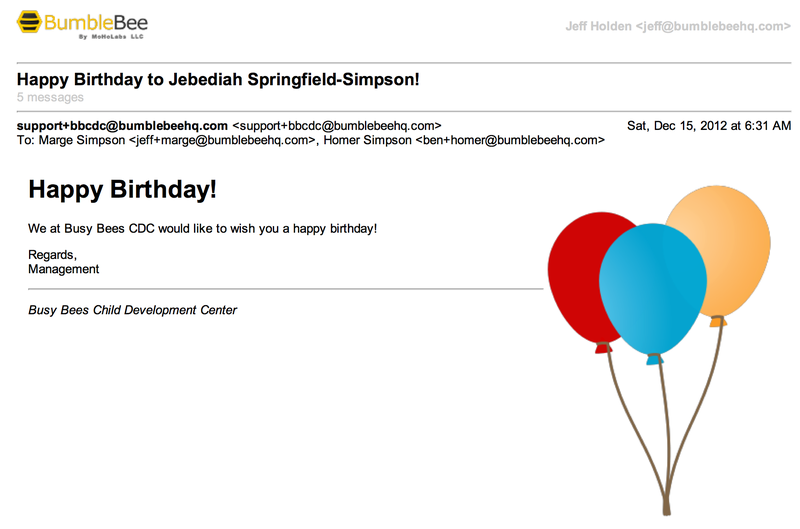 Do you send birthday emails to families today? How do families respond? 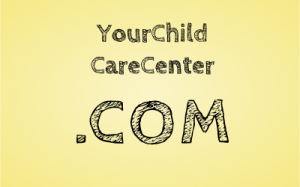 Picking and registering a domain name for your child care center is not as daunting as it seems. There are a two reasons this is difficult and I assume many child care organizations, especially larger ones, sub-contract this task. Coming up with a domain name to match your business name is hard. Registering that domain name and connecting it to your business like your website, email, online applications, Google analytics account, is daunting. Let’s try to break those issues apart and outline some practical steps to help you through each one. godaddy.com – You may or may not be offended by their controversial public image but they generally have the lowest prices for services. networksolutions.com (Our favorite domain name search tool) – Has higher prices but is a little easier and less cluttered than other sites with a easy-to-use search tool. Note of Caution: you can find your self spending hours on these domain search tools getting sidetracked on what domains are available. Searching for domains is inexplicably addictive. When choosing a domain name for your child care or daycare business, think about where you are starting. Generally, you will fall into either one of the following categories. If you have an existing child care name or “brand” like Best Child Care Academy and are well known in your area, you may not want to choose a clever new internet domain name. You may wish to simply register your school’s name. If that’s true, it’s possible that the domain name you would like is already taken. This was the case for BumbleBee Child Care Software. Obviously, bumblebee.com was already taken by the long standing Bumble Bee tuna company. In either case, simply search for your name on a the domain name registrar, like Network Solutions, and see if it is available and with which extensions (e.g., .com, .org, .pro, .co, .biz). I still prefer .com names because I think people still gravitate to those when typing your name but there is no reason not to use .biz, .co or .us as many people will be finding you with a search engine. If you do business as “Early Learning Academy” or “Harvard Preschool” you might find those are already taken by businesses nearby or outside of your area. In that case, you might want to consider incorporating keywords parents use when they search for child care. For example, using the names above, elachildcare.com or ela-child-care.com and cityofharvard-preschool.com or harvard-il-childcare. Having relevant keywords in the domain name is generally thought to help your search rankings and are some of the most common child care search terms on Google’s keyword tool. Furthermore, if the name families use to refer to your center is taken “brightminds.com” trying adding words like your location or type of school as suffixes or prefixes: schoolofbrightminds.com, dcbrightminds.com, brightmindsmontessori. If you can avoid hyphenation that will make your URL easy to spell but that is not a deal breaker. B. You are naming your child care center at the same time you pick the internet domain name. If you are picking the name for your new child care or rebranding an existing one, things are slightly more difficult. This is simply because of the number of options available. Without a doubt, some child cares and daycares choose the name of their organization to be easy to find on a search engine like Google. While you should consider the domain name when naming or re-naming your child care business, there are a number of other factors to consider like whether the name is being used in your geographic area or in the world at large. The last thing you want to do is have a legal fight over a trademarked name with costly legal bills and redoing the process. In that case, check with your state or national trademark office. Usually there is an online search to see if the name is available. Your local CCR&R’s can also help you likely help with this as well. It’s also challenging to pick a name that is easy to spell, easy to remember and conveys something about your child care or school. My best tips to help you pick a name: you should test that name on your friends and family to see what they think. That way you can avoid a mistake of confusing potential families like “Boring Early Learning Center” in Boring, Oregon. If you have done all of that then you should proceed to search online to see if you can find a relevant domain name for your new child care’s name (see above like networksolutions.com). Proceed as described above and find a domain name that fits your brand and is not easily confused with non-educational. Once you have settled on a domain name, you will want to act quickly, but not too quickly. What I mean is, domain names come and go, but you should not feel pressured to register your domain name. As I mentioned before, I like to search on Network Solutions for new domain names, but I suggest purchasing the domain name at other places depending on what your plans are. Here are a couple tips when you are ready to purchase your domain name. For example, we have a blog series on how to setup your child care center on Google Apps, you can actually buy your domain name on Google site as part of your Google Apps registration this will save you from having to forward the domain name and verify it later, making setup easier (Google partners with companies like godaddy and network solutions to offer this service). Also, vendors like godaddy.com often offer lower prices on domain name registration and management. I would discourage your from buying your domain name as part of website hosting services and stick with one of the larger registration companies already mentioned. It’s okay to skip registering the .co, .biz, .net, etc. versions of your domain name at the same time. Additional privacy for your listing is okay but probably not worth it and you probably won’t see a lot of spam when you register your child care center domain name. Forwarding and SSL is not necessary for your public dotcom website. Look for promo codes for either of the two sites we mentioned. Any questions? What was your experience registering your dotcom site? Did you do it yourself of did someone else do it for you? Heard about Google Apps and thinking about it for your child care? Here are some things to consider. I have talked with numerous child care organizations, preschools and daycares that are using Google Apps for Business. At the end of last year, Google stopped allowing new customers to join its “Google Apps for Business” for free, for organizations with less than 10 people (now $5/employee per month or $50/employee per year). What is Google Apps for Business and Why Is This so Confusing? Firstly, using regular old Gmail for your child care organization remains free and is not what we are talking about here. In other words, you can still setup busybeesacademy@gmail.com for free and have access to almost everything we discuss in this post. What we are talking about is creating a Google account where you login as queenbee@busybeesacademy.com using your own customized domain name and give your child care professional staff addresses like bestteacher@busybeesacademy.com. 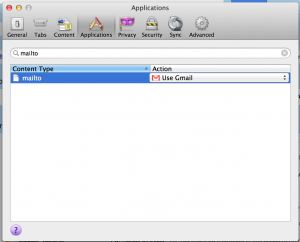 Gmail is simply the application you use to read and check you mail and the email server is hosted by Google. However, Google Apps is much more than using Gmail with your child care organization’s domain name. In addition to using Gmail and creating email addresses with your personal domain name (e.g., @busybeesacademy.com), Google Apps for Business is a substitute for Microsoft Office. It has a suite of web-based programs to do word word-processing and spreadsheets. If you have Gmail now, instead of logging in with your personal Google Account, you would log in with your child care’s email address. You can use the same domain you have now (e.g., busybeesacademy.org ) with Gmail. Now, I would not say that either Microsoft or Google are going to be winning awards for their clever and intuitive “branding.” I stumble to name Google’s products, Docs, Drive and Apps. (Not to be confused with **Google’s Android Apps**.) Confusing, right? One of the big differences between Google Apps for Business and Microsoft Office is Google Apps is web-based or cloud based just like BumbleBee. So you will need a computer with a decent web browser (BumbleBee recommends Google Chrome and Firefox). This means that working on spreadsheets, email and documents, while possible, creates some challenges when you don’t have an internet connection. I would say for most child care organizations, this drawback is significantly less important. Now to complicate matters more: Microsoft offers Office 365, to compete with Google Apps. But let’s set that aside for a moment. How Much Does Each Cost? As I mentioned before Google Apps for Business is paid for either by the month ($5) or by the year ($50) per user. Microsoft still sells Office, the latest version for PCs is 2013, and it costs $219 for one PC. I would say that most people I know, upgrade Microsoft Office every other release or when they get a new computer, so that would mean every five to six years. You might be thinking, Google Apps is much less expensive, but it’s is going to depend on how often you tend to upgrade and how much you value having the latest version. I would guess most child care organizations upgrade their PCs every 5-6 years. So that would mean user for user, you would spend $250-$300 over five years with Google Apps at the same time you would have paid $219 for your Microsoft Office license. Also, with Google Apps, you don’t have to pay for email servers (typically $16-26 per mailbox month) or Microsoft Exchange hosting (usually around $10/mailbox per month). The only thing you need for Google Apps is a connection to the internet. So I would say that is where you would achieve a the biggest savings. What Does Being In The Cloud Buy You? It’s not a completely apples to apples comparison (no pun intended) because that single copy of Microsoft Office is going to be locked into one computer. Whereas you could use Google Apps on any computer you own including your laptop, phone or iPad, all seamlessly. With the traditional model of Microsoft Office where you install the software on one computer, you would have to email the files, use a thumb drive or a network drive. We all know the problems that sharing files that way. Plus when you use Googles Documents and Spreadsheets, the files are automatically backed up in the cloud, and your revisions are tracked if you have a team of people working on a document. It’s all pretty seamless to collaborate on documents. Also, if you have everything in the cloud on Google Apps, you might consider Chromebooks when you upgrade your computers. They are low cost (around ~$250), well-designed, stripped down PCs that only work over the cloud and are designed to be used with Google Apps. My local public library has them and they work really well. When Google Docs first started providing Documents and Spreadsheets, it lacked a lot of features. Also, it seemed when a spreadsheet started to get to about 200 rows or more, the whole spreadsheet slowed to a crawl (or perhaps a toddle). Not any more. Also a lot of the more advanced features have been added. Google’s spreadsheets now have more advanced features like pivot tables and stock prices. Still there are some features that Google Apps is missing, and you could find that your go-to feature is missing. However, I would say for 98% of the work you do and most child care administrators and staff do, it will be just fine. There are many many features of Google Apps that I am not mentioning here like sending out surveys to families and getting the results in a spreadsheet, IMing, video conferencing and many more. I find myself using Google Docs more and more despite having the latest version of Microsoft Office, because the sharing is so easy and natural. Files are in the cloud, you can see when another person is editing a document and even chat with them. It’s easy to send those “documents” to anyone. You can email the document to people outside of your organization as “read-only”. 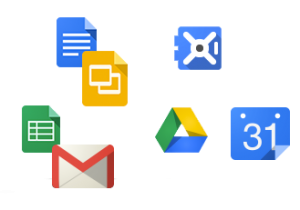 If you budget for regular equipment upgrades and/or have multiple sites or pay for email hosting, I would recommend Google Apps for business. I think your child care center or preschool is going to benefit from the flexibility and the sharing within your staff and with your families. You could also have staff meetings through video conferencing, which may help you with scheduling substitute teachers and care providers. If you are on a shoestring budget and have a old rattletrap PC that you keep together with band-aids, that multiple administrators and directors all share, I would say you should stick with what works. You are probably still using a simple AOL or hotmail address, and that’s okay. I think more and more you will find the benefits of switching to a web-based application will provide numerous benefits. Plus there will be intangible marketing benefits like having your branding built into your email address. What about Microsoft Office 365? Microsoft started offering a subscription based version of Office for $149 per year for small businesses (25 people or fewer) called Microsoft Office 365 for Business. The benefit is you get a lot of the features of Microsoft Office, but you don’t have to pay for upgrades and it’s more accesible from different locations and runs on up to 5 computers. Office 365 offers a number of features like email hosting and web applications. But it is a steep price increase from Google Apps and probably makes more sense for very large organizations and not most child care centers I talk to who are doing everyday documents and spreadsheets. Are you using Google Apps at your child care? If you started using it when it is free, would you pay for it? Am I missing anything other centers should consider before switching? BumbleBee has a number of ways that users can send emails to families: clicking on a family’s email address, sending bulk/mail-merge messages to selected groups of users (e.g., waitlist, enrolled, alumni), and sending automatic birthday emails. For most computer operating systems, when you click on an email address in a browser (or spreadsheet, presentation, etc. 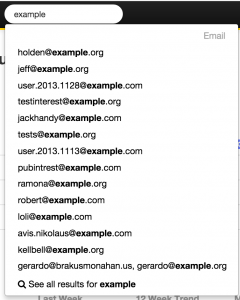 ), in BumbleBee Child Care Software or any webpage, the browser will launch the default email program from you computer: Microsoft Outlook, Apple Mail, Thunderbird, Postbox etc. But what about if your child care center or preschool uses Gmail? I have been asked multiple times if we can launch Gmail with BumbleBee. The answer is “Yes” but today it depends on what browser you use. If you use Google’s Chrome browser (BumbleBee recommends Chrome or Firefox for security, standards support and performance) when you go to Gmail for the first time, a bar will ask you if you want to use Gmail as your default application handler. If you cancelled this request, it still is possible to use Gmail. In Chrome, when you go to Gmail, you should see a “double diamond”. Click on that double diamond and it will give you three options. It’s a couple more steps to do so with Gmail in FireFox. Here is a link to the best explanation I found. The nice thing about Firefox is you can also add Yahoo mail if you happen to use that for you managing your child care center’s email. Unfortunately, this does not appear possible in Microsoft Internet Explorer (I am not using IE10, currently the latest version). Nor did I see a way to enable this with Hotmail or Outlook.com email, although those may be possible. Also, if you use Safari, this may be possible too. Are you using Gmail or Google Apps at your child care center? It’s one of the first, universal, real-world safety lessons we learn as humans: how to safely cross a road. And one of the few things that even people who are not parents or caregivers know to teach children: look both ways before crossing the street. I was surprised recently when I saw a news report on a study in New York City about pedestrian and bike safety. Despite our best intentions, some of the lessons we teach children about safety will not protect them from harm. For example, 6% of trauma cases at one New York City hospital the pedestrian was on the sidewalk. 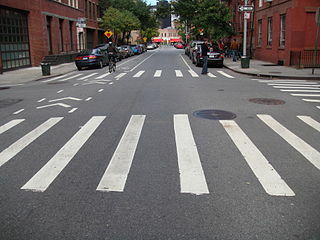 Shockingly, 44% of those injured in the street were inside of the crosswalk. Nearly 10% self-reported that they were using electronics when injured. Clearly, these problems are concentrated in crowded metropolitan areas. But, I am certain that they are a concern for rural and suburban areas as well. Have you already incorporated these safety lessons in your child care center? Have you had to update them or is this something that you feel is settled? Whether you “like” Facebook at your child care or daycare center or wish you could “un-like” it, Facebook’s Timeline view of you and your friends lives has become ubiquitous. So much so that when Facebook makes updates to the timeline view, as they are at the time of this post, it causes major ripples in the blogosphere and keeps users on their toes. Timelines are a very intuitive way to view information. That is why we brought our own take on a timeline for Child Care Center Management to BumbleBee. 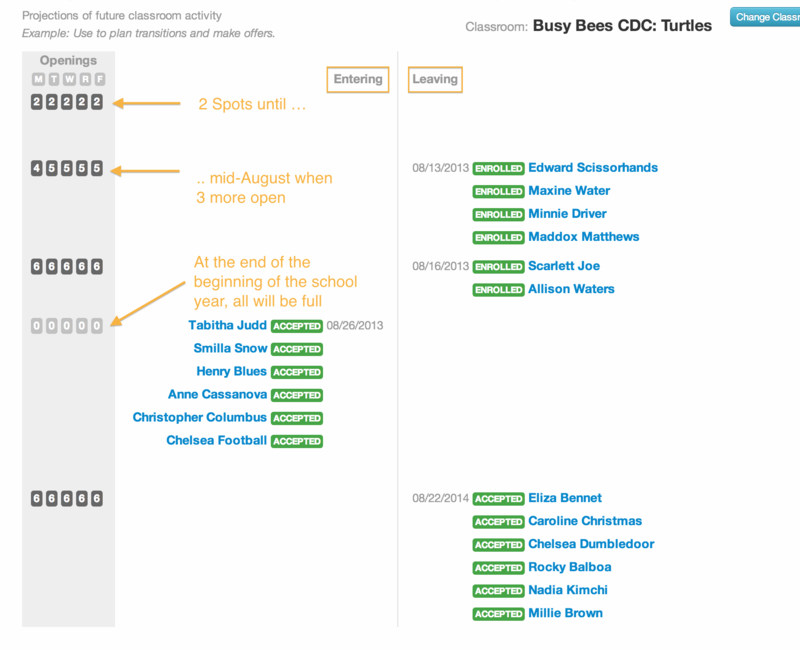 With our timeline report, for each classroom, you can see when children are coming and when children are going and how many spots will remain. This is an extremely effective way of visualizing your enrollment through time. It will also give you the ability to quickly see, by age-group, when a spot is going to open and in which classroom. BumbleBee has a built in process to help you manage a child’s enrollment at your school. You can mark spots as “Offered” and “Accepted” to keep track of children who will soon start or possibly start the next school year. Answer families confidently about when spots will open and how many have already been committed. Track families that have accepted offers for future dates. View transitions for current students. Manage transitions of children after they have left their current room. See openings by day of the week if you have flexible schedules. It’s easy to get your timeline to populate. Simply add start and end dates for each of your children (you can do this en masse with our bulk update features). Have you used the timeline (BumbleBee Childcare Software’s or Facebook’s)? What do you think? Families invest a lot in pre-school and child care. With such a large decision, it’s no wonder families spend a lot of time carefully researching and selecting early childhood education programs. BumbleBee Childcare Software surveyed families to see how they were making those decisions and how they viewed ther interactions with directors, managers and administrators. We compiled the results into an easy-to-read infographic about how families research and make child care decisions. Please email BumbleBee Childcare Software if you have any questions about the data.